Huddersfield all but ended Leeds United's play-off hopes by coming from behind to win the West Yorkshire derby. Stuart Dallas gave the hosts the lead with a header from Liam Bridcutt's deep cross, after Nahki Wells had seen an 11th-minute penalty saved by Leeds keeper Marco Silvestri. Terriers skipper Mark Hudson levelled from Jamie Paterson's corner. And Harry Bunn, Karim Matmour and Wells scored in eight second-half minutes to seal a comfortable win for Town. The Terriers took the lead through Bunn's low strike in the 69th minute, before fellow sub Karim Matmour tapped home for his first goal for the club and Wells atoned for his penalty miss with his 16th of the season. Leeds had gone into the match on the back of three successive wins but Saturday's defeat means they are now 15 points outside the top six with nine matches to play. 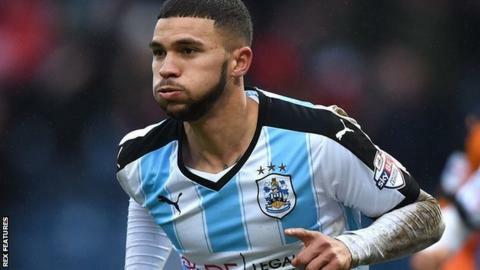 The victory lifted Huddersfield eight points clear of the bottom three in the Championship and avenges their 3-0 defeat in the reverse fixture in November. Both teams face Yorkshire derbies after the international break, with the Terriers hosting play-off hopefuls Sheffield Wednesday and Leeds travelling to struggling Rotherham. Leeds boss Steve Evans: "Huddersfield wanted it more than us in certain areas. "When I joined the job was to keep Leeds in the Championship and that gets forgotten. We have become a mid-table side. "It is easy to talk and harder to deliver, but I have a track record that I deliver. "Days like today teach you more than the days when you beat Bolton and Cardiff." Huddersfield head coach David Wagner: "This was a fantastic day. A brilliant three points, a massive three points, but I think we have played better games. "We were very clinical. We always moan that we are not clinical enough, but the story of this game was something special. "We missed the penalty, conceded a goal, but in the second half we were too quick and closed them down well. "We knew this was a massive game for all the Huddersfield supporters. We knew we had to repair and correct the 3-0 (home defeat by Leeds)." Match ends, Leeds United 1, Huddersfield Town 4. Second Half ends, Leeds United 1, Huddersfield Town 4. Alex Mowatt (Leeds United) is shown the yellow card. Attempt saved. James Husband (Huddersfield Town) left footed shot from the centre of the box is saved in the centre of the goal. Assisted by Nahki Wells with a through ball. Offside, Leeds United. Giuseppe Bellusci tries a through ball, but Mirco Antenucci is caught offside. Corner, Huddersfield Town. Conceded by Giuseppe Bellusci. Offside, Huddersfield Town. Joe Lolley tries a through ball, but Harry Bunn is caught offside. Mirco Antenucci (Leeds United) wins a free kick on the left wing. Attempt saved. Harry Bunn (Huddersfield Town) right footed shot from the centre of the box is saved in the bottom left corner. Assisted by Tommy Smith. Substitution, Leeds United. Mustapha Carayol replaces Souleymane Doukara. Goal! Leeds United 1, Huddersfield Town 4. Nahki Wells (Huddersfield Town) right footed shot from the centre of the box to the top right corner. Assisted by Joe Lolley. Substitution, Leeds United. Chris Wood replaces Stuart Dallas. Goal! Leeds United 1, Huddersfield Town 3. Karim Matmour (Huddersfield Town) right footed shot from the right side of the six yard box to the centre of the goal. Assisted by Nahki Wells. Foul by James Husband (Huddersfield Town). Goal! Leeds United 1, Huddersfield Town 2. Harry Bunn (Huddersfield Town) right footed shot from outside the box to the bottom left corner following a corner. Attempt missed. Mark Hudson (Huddersfield Town) header from the centre of the box misses to the left. Assisted by Joe Lolley with a cross following a corner. Corner, Huddersfield Town. Conceded by Marco Silvestri. Charlie Taylor (Leeds United) is shown the yellow card for a bad foul. Joe Lolley (Huddersfield Town) wins a free kick in the defensive half. Substitution, Huddersfield Town. Emyr Huws replaces Philip Billing. Stuart Dallas (Leeds United) wins a free kick in the attacking half. Substitution, Leeds United. Lewis Cook replaces Luke Murphy. Attempt blocked. Giuseppe Bellusci (Leeds United) right footed shot from outside the box is blocked. Assisted by Charlie Taylor. Substitution, Huddersfield Town. Karim Matmour replaces Jamie Paterson.